As you would expect the National Library of Scotland has academic journals on all disciplines and also Scottish magazines and serial publications ranging from influential 19th century literary journals such as “Blackwood’s Edinburgh magazine” to modern titles such as D C Thomson’s recently launched “Danger mouse” comic and the new Scottish football journal “Nutmeg”. What you might not be so aware of is our extensive collection of leisure magazines received via our Legal Deposit privilege. Our Legal Deposit privilege allows us to claim a copy of every issue of every magazine published in the UK and Ireland and means that we have almost certainly the largest collection of magazines in Scotland. 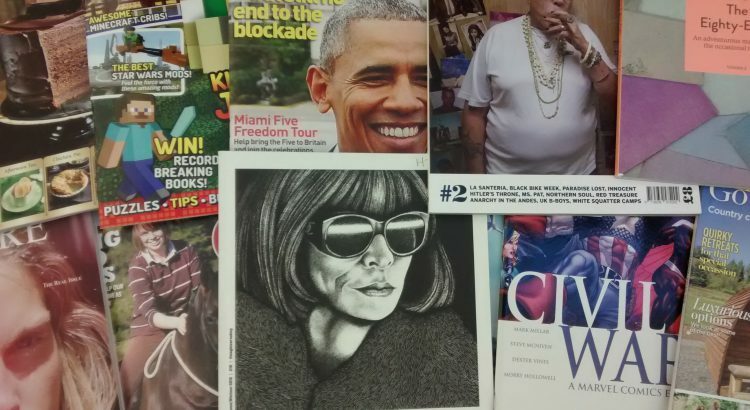 The Library has hundreds of magazine titles covering subjects such as fashion, computing, current affairs, cooking, crafts, popular and classical music. From 10th January 2017 we are exhibiting a selection of the titles we started to receive in 2016. It is an eclectic range of titles. “Minecraft mayhem” which gives tips on how to get the most out of one of the most successful computer games of all time. “Cuba si :the official journal of the Cuba Solidarity Campaign”. The issues we received cover an eventful year for Cuba that included Barack Obama’s historic visit to Havana and the death of Fidel Castro. “Shoreline of infinity” a digest sized science fiction magazine published in Edinburgh which reprints a 1911 story by John Buchan “Space” along with lots of new science fiction stories and features with a Scottish slant. “Rapha Mondial” a beautifully designed magazine on cycling. Alongside these are the self-explanatory “The barefoot horse magazine” and “Windpower monthly” plus the not so self-explanatory “Ranger” which has nothing to do with parks or football but is the magazine of the “British Free Range Egg Producers Association” and a copy of perhaps the ultimate magazine “Gym class” a very stylish magazine about magazines with a portrait of Dame Anna Wintour the long serving editor in chief of “Vogue” magazine on the cover. Magazines give an indication of the interests and obsessions of the day so taken together these magazines arguably give as good an idea of what 2016 was like as any end of the year review. The National Library of Scotland has long runs of many important British magazines and looking through them is a good way to capture the spirit of a decade or year. For example we have an almost complete run of “Lilliput” one of the most widely read magazines of the 1930s and 1940s. Founded in 1937 by the photo journalist Stefan Lorant its mixture of light features and photographs meant it thrived during World War Two selling hundreds of thousands of copies. Similarly successful during World War Two was the legendary “Picture Post”. Its mixture of photojournalism (including celebrated work by Bert Hardy) and campaigning journalism means that to leaf through its pages is to return to the Britain of the 1940s and 1950s. Similarly if you want to see quite how radical the British underground was in the 1960s have a look through our run of “Oz” magazine whose design and contents can still shock and surprise or recapture life in the 1980s by looking through our copies of style bibles such as “The Face” and “Arena” which captured the feel of a stylish decade thanks to the design of Neville Brody and the inspirational editorship of Nick Logan. If we accept the premise from the “Washington Post” that “News is only the first rough draft of history” magazines are perhaps a slightly more considered and often better illustrated second draft. The display is at the top of the main staircase in our George IV Bridge building from 10 January 2017 until the end of the month.